It’s always hard to compete early morning after being one of the last rides of the previous day. It’s a quick turnaround. You finish showing, then awards, a team meeting, dog walking, horse care, dinner, shower, another dog walk, and preparation of my show clothes, just to name a few things on my to-do list. In this case, an early class meant that we missed a lovely Open House party on Friday. Darn. The weather was optimum but neither my horse nor I were. Snickers was still not on full calories since the gas colic on Tuesday night. I was dealing with an infection, too. It wasn’t a bad test but nothing much to write about. I’m sure you’ve had days where you weren’t feeling it. Saturday was one of those days. A Turn on the Haunches is hard enough when we are both up to snuff! We all needed a good night’s sleep. Melanie and I were sleep deprived. The problem with Tryon (or Wellington, for that matter) is that there is so much quality horseflesh and so many amazing riders! Each day we find ourselves watching classes. Grand Prix, Freestyle, Para tests – all mesmerizing. The precision, grace, and partnerships are hard to pass by. Thankfully, nothing was happening under the lights Saturday night. There was a fun Exhibitor’s party, but I couldn’t keep my eyes open another minute. 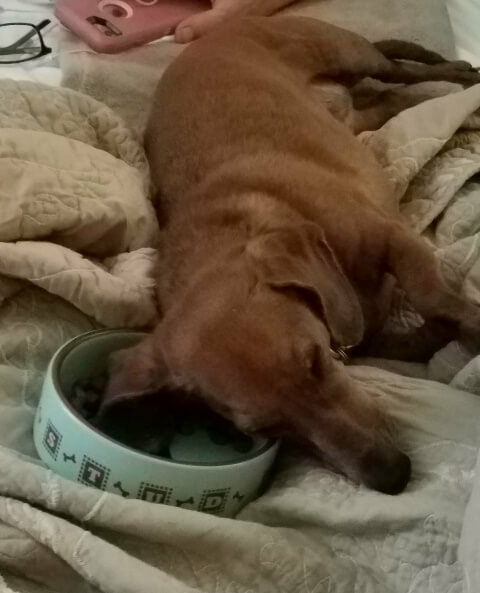 As I readied for bed, I took this picture of Katie, Melanie’s miniature Dachshund, asleep over her half-eaten dinner bowl. We feel her pain! 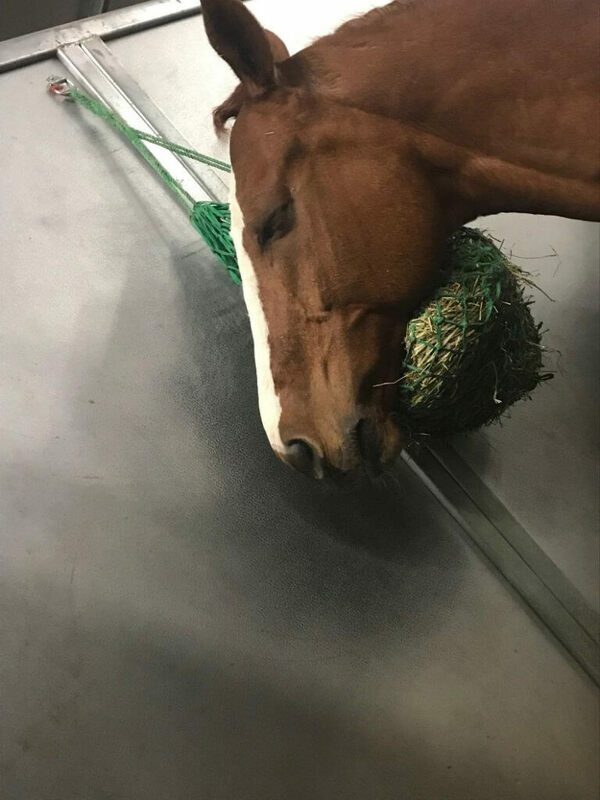 About a half hour later, my friend, Katie Jackson, texted this picture of Snickers asleep, using his hay bag as a pillow! Thankfully, he can sleep in Sunday morning. We don’t show until 2:08.